As you may know or maybe you’re blissfully unaware that Wednesday was MAN day at London Fashion Week, which saw great whispers and anticipation for the all new, LONDON COLLECTIONS: MEN, I know not the catchiest of names, set to launch on the 15th June this year. It will serve as a 3 day showcase, exclusively for British Menswear, with such big names as Sir Paul Smith, Margaret Howell, Aquasctum, Richard James, Calvin Klein and Tom Ford, OK the last two aren’t British, all confirmed as participating in the proceedings. Also, someone called Charles Wales, errr sorry HRH The Prince of Wales will mark the event by hosting a reception at St James’s Palace….. I better get an invite. Plus, there will be a change of venue no longer will the grandeur of Somerset House serve as the magnificent backdrop, but a move around the corner to the Hospital Club in Covent Garden. 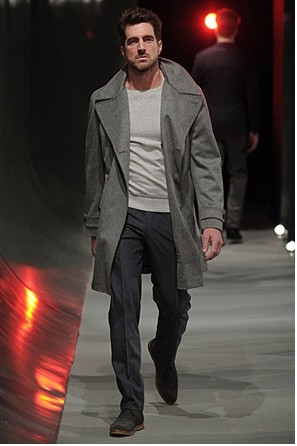 But back to the present, or at least the present shows, which were displaying to the Menswear press and buyers of the world, the Autumn/Winter 2012 ranges. The day started with J.W. Anderson, who described his inspiration as mix of Aristocracy, youth culture & individualism, have to be honest, I couldn’t see it myself but there were some great individual pieces. Next, the Great British institution that is Gieves & Hawkes literally steeped in history; this house has dressed everyone from Rock Stars to Royalty. In relatively new hands, Barry Tulip who was previously at Zegna & Dunhill, sited the three Davids as his inspiration. No! not Cameron, Jason & Beckham, tut, but Hockney, Hicks & Bowie. He offered an exceptionally wearable, luxurious and safe collection. 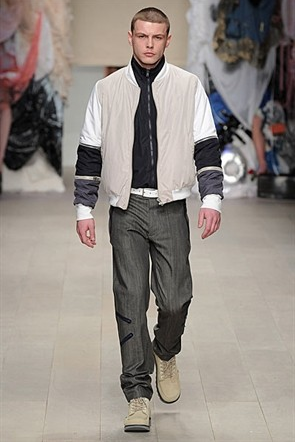 From formalwear to casualwear now as Christopher Shannon showed us his wears. The scouser who now has stockists from Sweden to Saudi Arabia, displayed a really wearable collection (see image below) which showed elements of Classic Moschino in its Streetwear. Shannon drew inspiration from Derek Jarman, Sinead O’Connor & John Maybury for the collection, now there’s an episode of Come dine with me, you wouldn’t miss. I then ventured round the corner and came across Baartmans & Siegel, who were showing later in the day at the Freemason’s Hall, what an incredible venue, nuff said !!!! The muse for this collection was none other then….The Milk Tray Man, yes the 1970’s man of mystery supplied the goods in a sartorial sense. Think Scottish cashmere, puffa coats and bobble coats, trust me it was very wearable, I promise. A change is as good as a rest and it was across the road to the Covent Garden Opera House for the TOPMAN Design show. A full house (see images below) and packed full of the brave and the bold, the meek and the mild were on full display, the celeb count included a very dapper Amir Khan, brother & sister Freddie & Emelia Fox, Ronnie Wood and Alex Zane. Later in the day I caught up with Gordon Richardson where we discussed the collection, I felt it was summed up by Ann Widdicombe’s quote regarding Michael Howard, “there was something of the night about him”, which he loved and completely agreed. 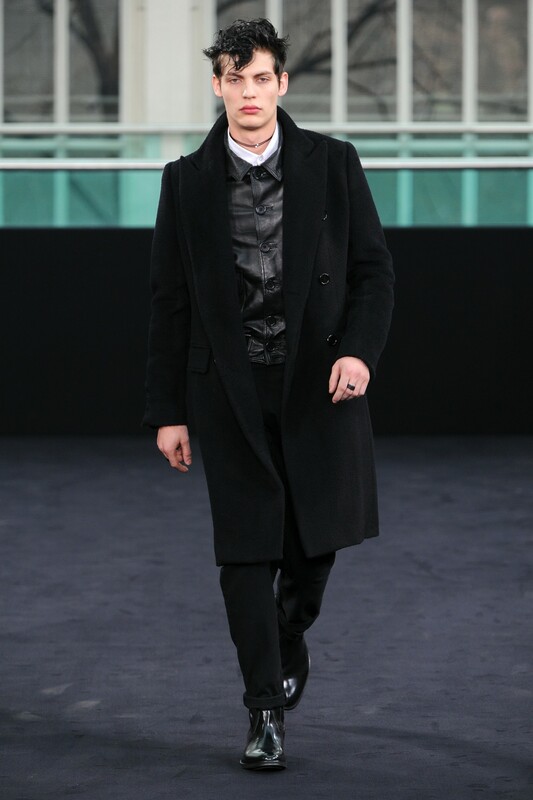 Both James Long and Patrick Grant for E. Tautz offered great collections for this season. 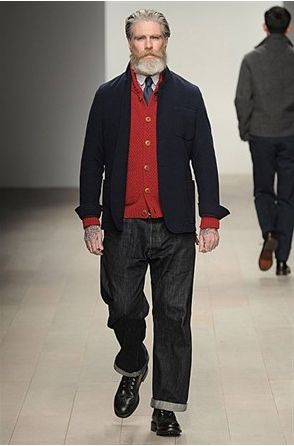 Long showed brilliant knitwear pieces from cable knits to cardigans and Grant showed what a master of tailoring he is and as he himself put it, “ At the heart of the E.Tautz collection is Savile Row cutting”. Moving on to a show I had been looking forward to, Oliver Spencer, a down to earth designer who offers great clothes which would look good on literally anyone and he didn’t disappoint. A wonderfully cast show, full of unusual models, not ugly, interesting, not a trace of a sickly looking teenagers in sight, but fella’s who looked as though they had lived a life (see image below). Workwear was fused with suiting and a young Lucian Freud was the iconic persona who supplied inspiration. The penultimate show of the day was Matthew Miller, a genuine buzz was around this show and Matthew Miller IS a name to watch out for. The demand to see this show far outweighed the size of the venue. Another great Northern talent, Miller has collaborated with the shoe genius that is Oliver Sweeney for this collection both the footwear and apparel reflected urban prints like modern camouflage, maybe not the easiest thing to wear in a single outfit but nonetheless unbelievably striking. Last of the day, but by no means least was Rake, held at the equally impressive Calridges. Fresh from dressing Tinie Tempah for the Brits, surely the winner of the best dressed male, if nothing else. Clive Darby, who previously worked for Savile Row bastions Richard James & Kilgour, displayed what can only be described as a masterclass in how a contemporary well dressed male should attire himself(see image below). Like Spencer, the show was cast with equally interesting individuals, models somehow doesn’t seem fitting. It rounded off a great day for British Menswear and illustrated what a world leading entity the British Style industry is, now can someone inform the government of that, oohhhh political. Next Post If there was a problem Yo, I’ll solve it.